A handcrafted, delicious vintage Americana Root Beer Review by Handy Father. This is a pure cane sugar root beer, and it is very sweet. It has a medium-dark color with a sweet caramel and vanilla flavor. It isn’t a strong “root beer” flavor, but is pretty good. More creamy, and reminds us of a cream soda a little bit. There is pretty good head on this root beer, but it does fully dissipate faster than expected. Pretty well-to-slightly over carbonated. It’s really almost too sweet to drink with a meal, but one reviewer says it might make a fine desert on its own. We gave the Americana Root Beer Review a score of 3.25 out of 5 stars for its over-sweet vanilla flavor, and slight lack of body. 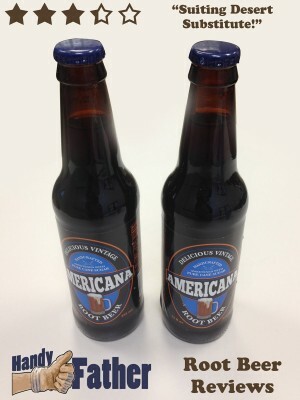 Americana Root Beer Ingredients: Carbonated water, cane sugar, natural & artificial flavors, caramel color, pure organic honey, extracts of licorice and sassafras root bark, citric acid, phosphoric acid. Americana root beer is made in America! Then give your Americana root beer review in the comments below or tweet @HandyFather.